Sauces can transform the most ordinary meal and make it irresistible. However, if we are following a low calorie diet we may feel we have to play safe and avoid sauces altogether. That would be a pity since there are any number of delicious low fat, low calorie sauces that would make an ideal accompaniment to a meal. You can start by changing to a healthier method of cooking a sauce and then substitute low calorie ingredients to produce mouth-watering, lean alternatives to use with all kinds of recipes. The white sauce that is the basis for so many classic sauces is traditionally made with butter and flour. 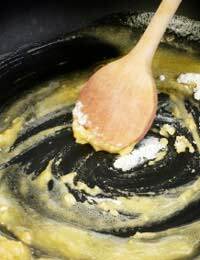 Low fat spreads can be used but they don’t blend successfully with the flour to make a roux. Instead try this easy all-in-one method. Put 25 grams low fat spread and 25 grams plain flour in a saucepan with 300ml skimmed milk. Over a low heat, bring the contents to the boil, stirring continuously, until the mixture has thickened and become smooth. Should the sauce look lumpy, remove it from the heat and whisk thoroughly. You now have a good base for a variety of sauces such as parsley or cheese. Barely a tablespoon of grated Parmesan cheese, which is so intense in flavour, would give a low calorie cheese sauce for use with pasta recipes. In place of full-fat cream cheeses in a sauce, use ricotta, a low fat fromage frais or other low fat substitutes. Where recipes call for a creamy consistency in the sauce, use low fat natural yogurt or half fat crème fraiche in place of cream. To prevent separation when the sauce is heated, stir 2 tbsp of cornflour in to stabilise it. A good accompaniment to vegetable recipes, this tangy sauce is very low in calories and is packed full of vitamins. Blanch the watercress and rocket in a pan with boiling water for 2-3 minutes. Drain and put into cold water to refresh. Drain well and chop. In a blender, puree the watercress and rocket with the yogurt until smooth. Season with salt, nutmeg and pepper. In order to reheat the sauce, place it in a bowl over a pan of gently simmering hot water. Take care not to let the sauce curdle. Garnish with watercress. This colourful, low fat sauce, made with yellow peppers, is perfect to serve with turkey or chicken and other mild flavoured meats. Heat half the oil in a pan and gently fry the peppers and onion until they begin to soften. Add the orange juice and stock and continue cooking. When the mixture is very soft, press it through a sieve, or blend until smooth, then strain it back into the pan. Season the sauce and warm it through, or serve it cold. An ideal accompaniment to a lean meat or vegetable dish, this low fat sauce is a simple variation of the white sauce described earlier. Melt the low fat spread in a frying pan and add the mushrooms. Saute gently until soft, around 5 minutes. In a saucepan, place the remaining low fat spread, flour and milk. Over a medium heat, cook the sauce, stirring continuously, until it thickens. Now add the mushrooms and season to taste. Lemon and fish are good partners and this light, tangy sauce is simple and light. Cut the lemon rind into thin julienne strips and put into a saucepan with the lemon juice, ginger and wine. Season to taste. Simmer uncovered for 6 minutes. Mix the cornflour with 1 tbsp of cold water and add to the saucepan. Simmer until clear. Immediately before serving stir in the chives.